Claire grew up and spent her early adult years near Paris, studying information technology at IUT Paris V Descartes. At 27, the year the first of her two daughters was born, the suburbs of Paris were starting to grate. For her peace of mind and her daughter’s well-being, she made her way to Vendeuvre; a small, green, and quiet town in the Lower Normandy region of France, where people are—as Claire says—“generally kind and helpful”, even with administrative affairs. Aware of how suburbs around Paris (and other French cities) can be, I could appreciate Claire’s decision to get away, and Vendeuvre sounds like a lovely place. The principle landmark is the Chateau de Vendeuvre. For a couple of years beginning 2006, she took courses at CNAM (Conservatoire National des Arts et Métiers) in Caen to supplement and formalise the kinds of things she had been teaching herself over the years. A woman freelancing in France. It’s all about character. I like to follow the evolution of a project myself, from start to finish. I want to take care of it personally, without any go-betweens. I worked for someone else in the beginning of my career, when I had to polish up my arms with independence in sight. Working independently was an early on decision. In case you’re confused about her use of “arms”, it’s a reference to weapons, as in she was prepping for independent development battle. Let me tell you one anecdote from the late 90s. A potential client called, and after a short discussion we spoke about my methods. When I explained that my office is at home, I pointed out that it’s a good compromise for a woman because it allows her to take care of children too. He was surprised when I told him that developing and raising children are two full-time jobs that can not be done at the same time. It tells a lot about how women’s work is considered, and paid, and how children are seen. I didn’t work for him. By simple, I mean from my developer point of view. I’m neither a designer nor really sharp in front-end development. I wanted a system that is simple to implement and customize, not just simple for the final user. Of course, as for many, I’ve been puzzled by the model. But once I got it, how wonderful it was to play with! If you’re a developer, it’s just a matter of hours to understand how to extend core functionalities by writing a plugin. If you’re not a developer, just check the plugin resources or ask in the forum. I really love the great community, where you can always find a helping hand or two… or more. 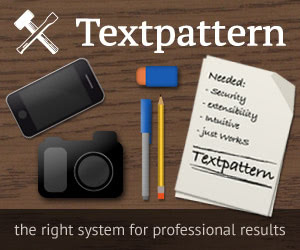 Textpattern’s extensibility and the ease of understanding it is the main reason Claire still uses the CMS today. She’s looked at systems like WordPress and Joomla, and says while they seemed simple from an end-user’s point of view, they didn’t offer the clarity she needed as a developer. The only other system Claire has really worked with is PrestaShop, a system specialised for e-commerce. This isn’t too surprising since nothing is provided for e-commerce in the core, and e-commerce solutions are frequently sought by web designers using Textpattern. A list of e-commerce systems tried with Textpattern might be a useful thing to start somewhere. A detailed tutorial on integrating Textpattern with one of the systems would make a great article in a future magazine issue. Maybe Claire would be willing to draft one for PrestaShop. Taking the yin with the yang is the best way to find where problems exist and which are most troubling for the majority of people. So I asked Claire what she thought could be better about Textpattern. She doesn’t find any “unacceptable defects” that can’t be dealt with by an existing plugin, which is a pretty typical response coming from a plugin developer, but two things did seem to trouble her most. To be totally in line with the concept of section, which relates to presentation and not organisation, the template used by a sub-section should be the same as the parent section, and cannot be changed. My 2 cents. In effect, you wouldn’t see any fields to assign pages in the child sections of a given branch, there would be no point since they automatically adopt the parent’s page assignment. Until such a hierarchy is ever built into the Sections panel, Claire advocates adi_menu to accomplish the same thing. It can be helpful to know how freelancers talk about Textpattern to clients; how they sell the idea of an open source platform, and what client reactions are. For example, we have inside knowledge that smaller businesses in the U.S. give warmer reception to using Textpattern, but bigger companies are much less willing. Of course there’s no specific reason for that, but it’s important to understand because it suggests there’s a communication (or trust) problem somewhere… perhaps a marketing problem with Textpattern itself. I asked Claire how she talks about Textpattern with her French clients. Are they trusting? Do they see a free open source solution as a competitive advantage, or more as a financial or technological risk? works, no matter how, or what is behind it. They do not know about computers, and this part is mine, letting them concentrate on their own activity. I will agree with Claire that a lot of companies in France don’t care about technological details, and will simply trust that the web solutions provider fixes things. But the client’s lack of understanding about web standards and smart design/development conventions is also a problem. The “carte blanche” trust that clients give to many web “experts“—often IT companies that jump into the web design business and give flashy song and dances about their do-it-all tools—frequently results in the client being sold a proprietary gizmo that employees can’t use. The whole process repeats in a few short years when the client finds another IT miracle worker to fix the previous disaster. Underneath it all, the client never advances on the business issues it needed to fix to begin with. This kind of thing happens all the time, and not just in France. There’s a pitch to be made here about web service providers taking the time to educate their clients on standards, best practices, user needs, and so forth, but I’ll leave that to your imagination. There are actually two plugins. The first one is a customised yab_shop. Even if the original yab_shop is not perfect, at least it exists and is an excellent base to work from. For example, I replaced the quantity input field with a dropdown box to prevent customers ordering more products than actually available, I also set up an order management; i.e., a database storage to keep track if something goes wrong during or after the payment, and to prepare invoices. The second was my own, a custom admin-side plugin that generates invoices from placed orders. It was developed in an emergency, and in spite of common sense. It works, but can not be distributed (not even for free, no way). Custom invoices? Can’t share it? Drat! 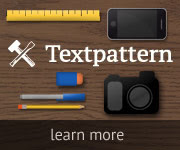 Do you think you could lead a Textpattern workshop to a room full of people, or give a presentation—even a five-minute lightning talk—about Textpattern development to a live audience? I think yes, rather for a short presentation of the basics, or the schema I usually use to build sites. As a programmer, I have a modular approach and consider pages as main functions, and forms as functions or procedures. A topic could be how to distinguish between the different parts of a page, translate them into reusable forms, reassemble these forms while keeping as much expandability as possible. In the spirit of The Setup, I thought it would be interesting to put similar questions to Claire… and for that matter, to everyone else we spotlight in the future. After all, seeing what other people use and do is how we often learn to do things differently ourselves. A lot can be revealed by three simple setup questions, not only about process and tech, but about the person, too. What hardware are you using, Claire? My main machine is a desktop computer, 500GB RAID1 for storage, quad-core processor, and 4GB RAM because I sometimes have to do video processing. I also use a minimalist but efficient laptop when I visit clients or work outdoors, which I like to do when weather permits. The desktop is running Ubuntu 11.04 as an operating system with Gnome UI. It acts like a server, client, and workstation all rolled into one. I have Apache, MySQL, and PHP installed for development, and Samba and SSH for local resources sharing. I use Firefox and Opera browsers, and Thunderbird for email, news, and feeds. For documents I use LibreOffice, GIMP for graphics manipulation, and Kino and Avidemux for video processing. The laptop runs Ubuntu 10.04 and Gnome UI too, but it’s mainly used as a terminal with few applications installed; namely, LibreOffice, Firefox, and PuTTY. Data and documents stay on the desktop server. You probably noticed there’s no IDE or sophisticated development tool. A basic text editor and a few brain-powered fingers are sufficient and available everywhere. I already have everything I need, except perhaps a more stable ADSL connection. But we must set priorities and accept that technological miracles fail against the forces of nature, especially when you decided to live in a secluded countryside. I wrapped up my interview with a few light-hearted questions. If you could only work on one website for one year, powered by Textpattern or not, what would it be? Definitely abc-tricot.fr. I’ve actually been working on it since it went online in 2009. It is my experimental area… my learning field. There is always something to do there. Is there anything else you would like to add or say about yourself, Textpattern, or France? My experience developing websites may seem slight. There is a reason for it. Let us say that among the life choices that were given to me these last 10 years, I focused on the extraordinary children who gave birth to me (yes) while continuing to self-train on the web and its technologies. I consider having had a great chance to learn a lot about humankind, which is at least as useful as the technique.